Canada’s ultra-highspeed network used by universities, colleges, and scientific research outfits across the country plans to use funding from Ottawa to expand its program for small businesses to test pre-commercial products on the infrastructure, according to an announcement made yesterday. Ottawa will fund the CANARIE research network for $62 million over the next three years. CEO Jim Roche is pleased with what the non-profit organization that links universities, colleges, research institutions, hospitals and government labs got. 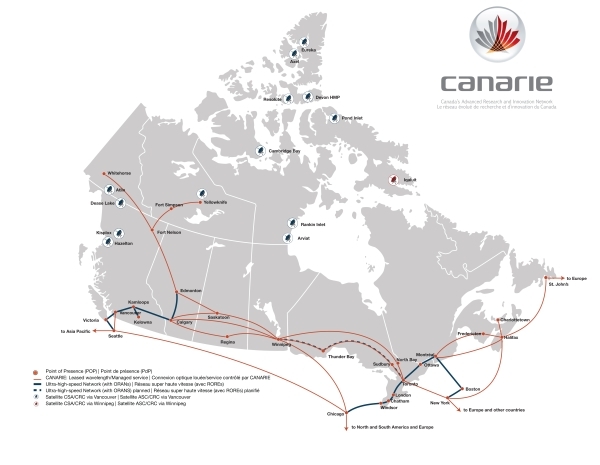 With funding assured for several more years CANARIE can continue to build out its core network, with the goal of buying more fibre to be able to offer 100 Gbps service across the country; to develop software that researchers can use for high performance and cloud computing; and to offer cloud computing and expertise to small and medium businesses test next-generation products. For example, a company that develops an online game may want to use the network to test the pre-production software’s ability to handle thousands of users at once. The offer is open only to companies for non-commercial applications. Once the software is sold commercially, companies have to turn to commercial cloud providers. “We’re effectively helping the adoption of digital technologies in the private sector,” Roche said. Called the Digital Accelerator for Innovation and Research (DAIR) program, SMBs have been able to use CANARIE’s network on a trial basis for free for the past year for this kind of work. But starting next April the network will charge a nominal few hundred dollars for its use, Roche said. It means he won’t be able to offer multi-national companies who have research branches here the ability to use the high-speed network for developing applications. Overall, the funding announcment is a mixed blessing for the research network. On the one hand, the money is more than the $40 million over two years originally announced by the Harper government in the spring budget. On the other hand, it works out to less money a year than the network got over each of the past five years — $21 million compared to $24 million. That’s a 15 per cent drop in annual funding, he says, which means membership and user fees to the institutions that link to the network will be going up. Increasingly it charges user fees and membership fees, he said, so only 40 per cent of the cost of the infrastructure comes from the federal government. Sixty per cent comes from provinces and those attached to the network. For the future, Roche wants CANARIE to own more of its network. It now owns pockets in Western Canada and the Maritimes, while leasing capacity from BCE Inc.’s Bell Canada, Rogers Communications and Telus Corp. Through satellites, it stretches to northern British Columbia, Nunavut and the Northwest Territories.